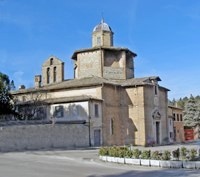 This church, which was originally dedicated as Santa Maria del Massaccio formed part of a hospice and refuge for pilgrims. The present structure was designed by Francesco di Bartolomeo da Pietrasanta, who received payments for it in 1490-2. Its exterior was never finished. The church acquired its present dedication in 1790 when the earlier church of San Rocco in what is now Piazza Carducci was demolished to make way for the enlargement of San Luca. The church is closed but occasionally used for exhibitions.